We toured the pools and muddy ditches of the Azores. These are usually mere puddles, and any waders that may be around will congregate in these small feeding stations. But it rained. The pools were ponds, the ponds were lakes. The waders that may have been eking out a living on the muddy margins now had a choice of gourmet restaurants open for business. If there were any waders here in the first place – which I doubt. But we tried our best – hardly a lake, coastal margin, or bucket of stagnant water went unregarded in our search for something that wasn’t a sparrow. Eventually we rocked up at a large lake. There were a few mallard, and some of those weren’t exactly pure bred. But we persevered and took a little walk through some adjacent woods and small-holdings. 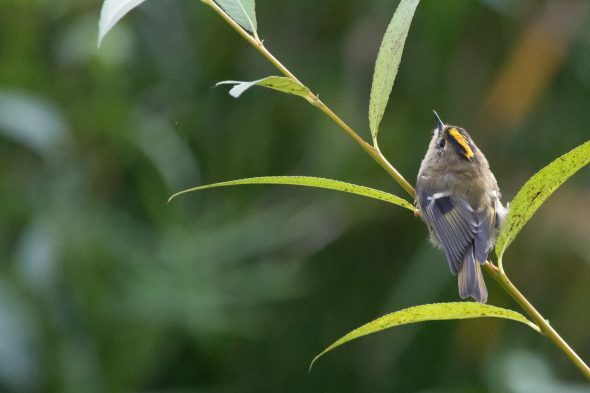 There were plenty of Goldcrests (Regulus regulus azoricus) – there are three sub-species on the Azores – and Waxbills (Estrilda astrild), but one of our group saw a Common Yellowthroat flying away from him. In the best traditions of birding we gathered the rest of the gang together and stood around the bush where we thought the beast had gone. I thought it had flown out into a small allotment 100 meters of so away, and I wandered off there since I had had enough of staring at the bush in question. Within a couple of minutes I had relocated the bird and within 10 minutes everyone managed to get a decent view, and some (not me) a decent picture or two. So instead you get to see one of the local Goldcrest. Enjoy.